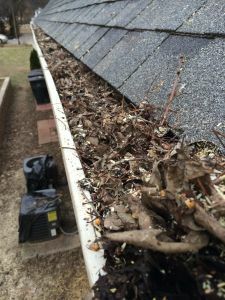 If you’ve read our blog at www.GutterTalkBlog.com, you’ve likely learned how important it is for your gutters to be pitched properly towards the downspouts in order to drain water. While this concept seems obvious — properly pitching gutters from end-to-end — it is surprisingly difficult to find in practice as found on these Knoxville gutters. 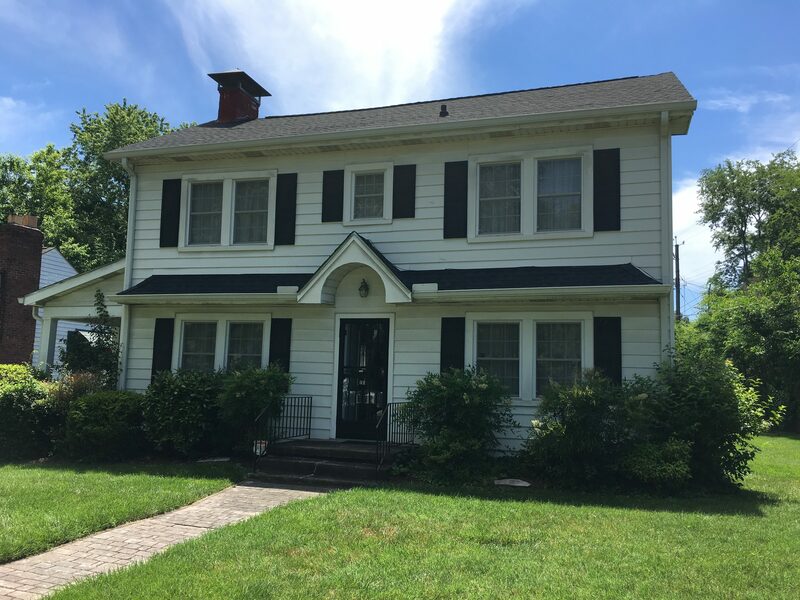 Take this 1920s Knoxville, Tennessee, colonial. 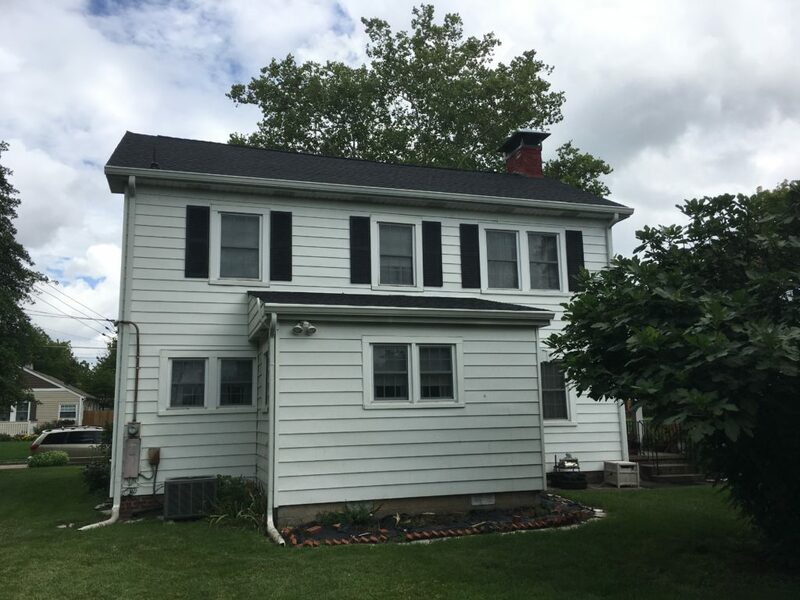 When the homeowner contacted us — citing that her recently installed 6” aluminum gutters weren’t performing properly — we found frowning gutters when we visited her home. BEFORE: Front gutters droop to the left and are higher on the right side, creating an asymmetrical look. Generally under-pitched gutters are a problem. But this wasn’t the case. These gutters had plenty of pitch. In fact, I dubbed these gutters “frowning gutters” because they were installed high in the middle and drooped down very far on each end. Looking at the house from the ground, it looked like the gutters were frowning. It was a sad sight! The homeowner believed was that she had bad wood or no facia boards behind the aluminum fascia wrap and she was worried about critters getting into her attic. 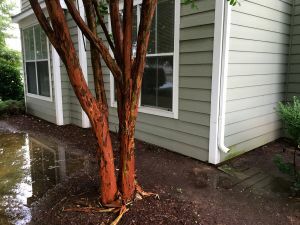 Additionally, on the droopiest part, water was spilling over the gutters to the ground because the gutters had disconnected from the house. To put this into perspective, her gutters were installed about 2 years ago. So she has nearly new gutters that were not working properly. 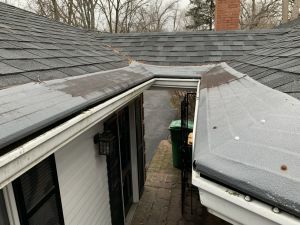 My recommendation was to reduce the pitch in the gutters by loosening and reconnecting them with the correct pitch by using a level and then installing our MicroScreen US gutter guard that slides under the first course of shingles. This would close any open gaps between the roof decking and the gutters, and would keep out critters and inclement weather. The homeowner asked that if we found any bad wood, to let her know so she could have it replaced. She had a bad experience with her roofer, who said there was rotted roof decking and charged her for replacing the plywood but never actually replaced the bad wood with new decking. She didn’t want to be burned twice. I reassured her that if we found any bad wood, we’d replace it. Once we climbed the ladders, we found that most of the fascia boards had deteriorated to the extent that the wood crumbled in our hands. The gutters had been installed with an extreme slope because it was hard to find good wood into which to attach the screws. Modern day gutter hangers are designed to screw into fascia boards and stay put. These gutters had pulled away from the house on one end. That’s a sign that they either weren’t screwed in to begin with or the wood behind the gutters is bad and the gutters simply pulled away from the boards. In this case, it was the latter. Bad wood abound behind the aluminum fascia wrap. The gutter installers had also nailed the gutters to the facia boards because it was evident that the screws in the hangers were not biting into the wood. It’s beyond us why the previous gutter installers didn’t alert the homeowner about this issue. We determined that to properly fix the problem, we’d need to remove both upper sections of gutter on the front and back of the house, secure the aluminum soffit panels that were held in place by the aluminum fascia wrap, remove the fascia wrap, and then replace the fascia boards as necessary. We also determined that some of the rafter tails were similarly decayed at the exposed ends, so we may have to sister sections of 2×4 lumber to create nail points for the new 1×8 pine boards that would become the new fascia boards. 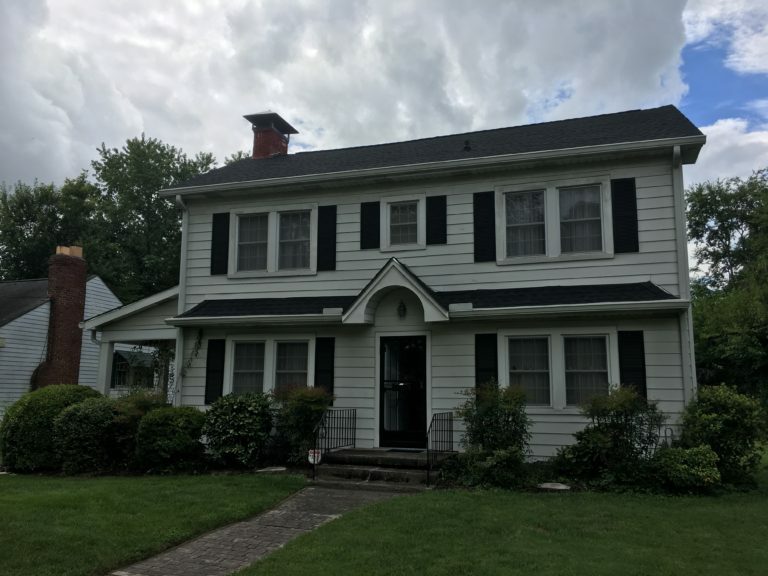 In the end, we replaced about 100-feet of wood; we reinstalled the aluminum fascia wrap, rehung the gutters with the correct pitch, and installed MicroScreen US gutter guards. 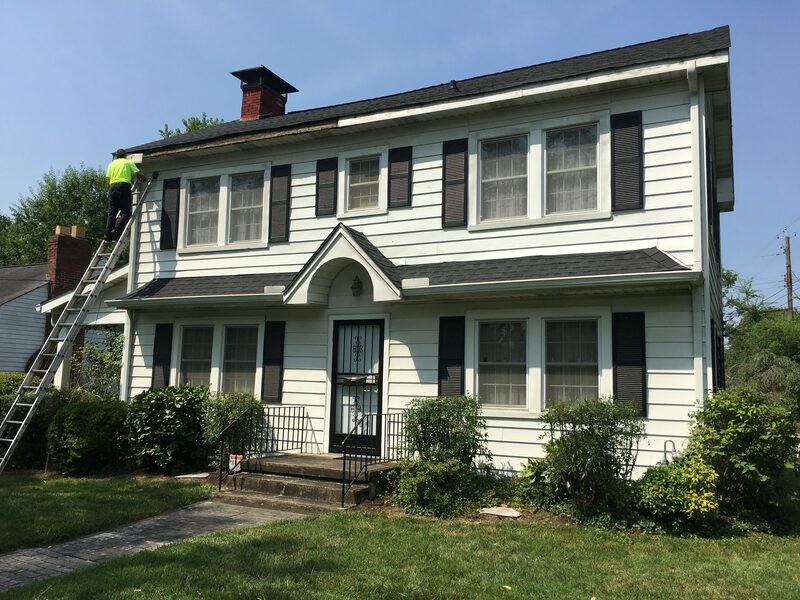 This additional work cost the homeowner about 50% more than the original gutter guard estimate, and it added a second day to the job; however, she and we agreed that it was the only way to correct the problems and do the job right. AFTER: The frown is gone. Fascia boards were replaced and the gutter was reinstalled and pitched using a level. MicroScreen US gutter guards installed to shed leaves and prevent water from wicking behind the gutter. Needless to say, she is pleased with the fact that we kept our word by fixing a problem that would have only gotten worse; we gave her newish gutters a new lease on life, and we installed gutter guards that will no longer require her hiring handymen to clean her gutters. Why do you think the previous gutter contractor ignored the obvious bad wood issues and didn’t bring it to the homeowners attention so it could be fixed properly the first time? If you are experiencing water problems and issues with your gutters in Knoxville, West Knoxville, South Knoxville, Farragut, Clinton, Oak Ridge, Fountain City, Maryville, Alcoa, Sevierville, Kingston, Loudon, Lenoir City, Tellico Village or anywhere else in greater Knoxville, please reach out for assistance at 1-865-622-2141. With over 20-years experience, we can help you assess the source of your water and gutter issues, and provide you with a solution to fix the problems once-and-for-all.